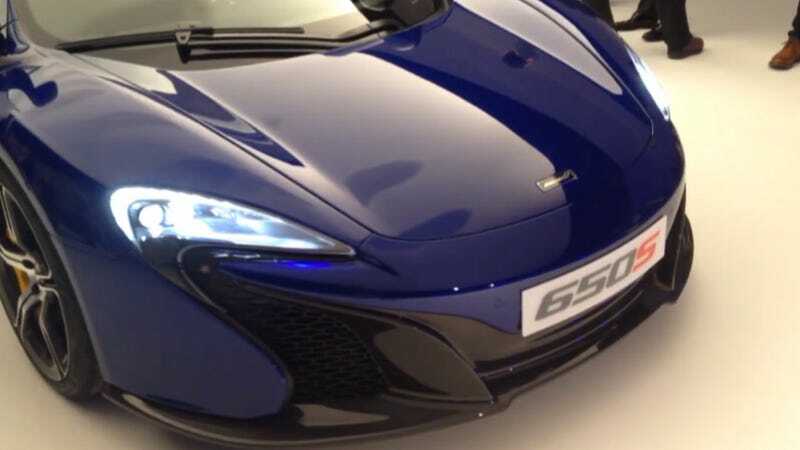 The leaked images of the McLaren 650S started in dribs and drabs, as they tend to do, but now those leaks have turned into a virtual flood, with this walkaround video that gives you the clearest, most comprehensive look yet. And the McLaren 650S looks like the 12C you always wanted. This brief clip, that appears to be part of a larger video, looks like it was shot at that rumored un-secret presentation in London. It's a supercar, it should be about people enjoying the driving experience. With the 650S we've got faster, more emotive down-changes. So more flair on the down-change, we're allowing the car to make those multiple gear-changes. We've really worked on steering feel, and steering response. He then goes on to discuss the transmission some more, and about how that is all just better for the soullessness, though I really hope he's right. Rarely is such a complex and vague problem solved by just some tweaks to the transmission software, so maybe there's more to it. He goes on to say that with the 650S McLaren is looking to bring the car's looks more in line with the "family look" that was started with the P1. There already seems to be a bit of an outcry about this one, since it's no so much a familial resemblance as it is a near copy of the face, but maybe there's something we're not getting. It's not that the P1 or the 650S looks bad, per se, just more like when you're dropping anywhere from $200,000 to $1,000,000+, you want your car to look a bit unique.